This essay is in my book "Science and Insight for Science Fiction Writing" which is now available at Author House -- Amazon -- Barnes and Noble and other fine book sellers, search for "Roger Bourke White Jr."
This is Part One of a two part series. Part Two covers the brain's archive and subconscious processing functions. The human nervous system is an engineering wonder. Like any good wonder it's a delicate optimization between many difficult constraints. Some explanations: The top of this stack represents heavy thinking; the bottom represents speed thinking. Reflexes at the bottom are very fast responders and require little computing power to accomplish their tasks. Judgment at the top requires lots of thinking power and lots of time to accomplish. The layers in between -- Habit and Morality -- are intermediate. Habit is the layer of thinking that takes over once Judgment decides on a course of action. Habit picks and chooses among reflexes. It decides which reflexes to turn on, and when. Once Judgment decides it is time to take a shower or a bath, Habit takes over the details of picking reflexes to turn on water, check the water temperature, do the lathering up, and so on. Habit is on the verge of consciousness, sometimes we remember what we did, often we don't. Morality sits over Habit, and handles the questions of the goodness and badness, and rightness and wrongness of various courses of action that have previously been contemplated or experienced. Judgment handles "novel" actions and situations -- things that are new experiences to the body. Once Judgment has made choices on how to deal with the new experiences, Morality takes over. Examples of Morality are: a person arguing or preaching on a topic that they have talked on many times, deciding whether or not to speed on a particular section of road, and whether or not to remember an anniversary. Why have a Judgment layer? Judgment is a processing intensive and slow-to-complete process, but Judgment is the "smart" layer of the thinking process. Judgment deals with "novel" situations -- those situations the body hasn't encountered before. Judgment also trains the rest of the stack. When a person is learning some new task-- tasks such as a child learning to swing a baseball bat, ride a bike, or arithmetic -- Judgment is heavily involved. If, as an adult, you want to experience Judgment in action on a physical process, try doing something you haven't done before, such as writing your name with your off hand, or writing your name so it displays correctly in a mirror. Notice how "hard" you have to think about what you are doing, and how you must think of every motion in the process. This is the Judgment layer handling the whole task. Children stare because they are looking at something novel, and learning. When a child is staring, the Judgment layer is fully active, and the child is busy learning a lot. Adults tell children not to stare because in an adult staring can be something quite different. The adult stare is often the first step in a sequence leading to an aggressive act -- it is the stalking stare. The adult stare can indicate "fight or flight" reflex is kicking in, rather than indicating Judgment is active. The adult who cautions a child not to stare worries that the child learning stare will be misinterpreted as an adult hostile stare. As a person practices and learns, Judgment is handing off roles to other, faster, processes. Judgment trains the other processes. If the process is a highly physical one, such as baseball and bike riding, the Habit process and the Reflex process take up most of the load as the process becomes learned and "second nature." A person who has ridden a bike for a year no longer is much aware of balance or pedaling -- Judgment is not involved in those details any more. Judgment will produce a destination, a rate of pedaling, and perhaps a map if the destination is novel, but once those are announced to the body, habit and reflex take care of the details. So, Judgment trains Habit and Reflex. Once they are trained, Judgment is called upon to initiate actions, and then "gets out of the loop." If Judgment thinking is so slow, why do we have Judgment? Because the Judgment layer makes decisions well. It is wonderful at recognizing patterns, imagining things, and showing "good sense". It isn't fast, but it handles novelty and complexity very well. If an action to be undertaken is cerebral, sophisticated or social, then Morality is what is trained by Judgment rather than Habit. Morality is traditionally associated with right and wrong actions, but in my view, it handles much more. It handles traditional questions of right and wrong such as, "Should I rob a bank today? ", and it also handles all those social actions upon which Judgment has made a decision, and doesn't want to be bothered any more. Morality handles things as mundane as who to say, "Good Morning." to as you pass people in the hallway. It handles things such as "Who's special days will I remember? ", and, "Who will I feel concerned about if they seem troubled?" If the choice concerns a person gets troubled on a regular basis, Morality will even handle how to react to the trouble symptoms -- if Habit doesn't take that over from Morality. The result, and goal, of Morality is the faster processing of social and intellectual issues. When we walked up to the window, the lady there quickly informed us that she couldn't serve us unless we were in a car. When Marty asked, "Why?" She quickly replied that it was a security issue and went in to some detail of what the problem was. When Marty asked, "Can I talk with the manager?" She quickly replied, "I am the manager, and if you have further questions about this policy, you can call International." While the Morality layer was dealing with Marty, her Judgment layer was dealing with other issues, and while she was in that state, Marty would not be able to convince her to sell us a burger. 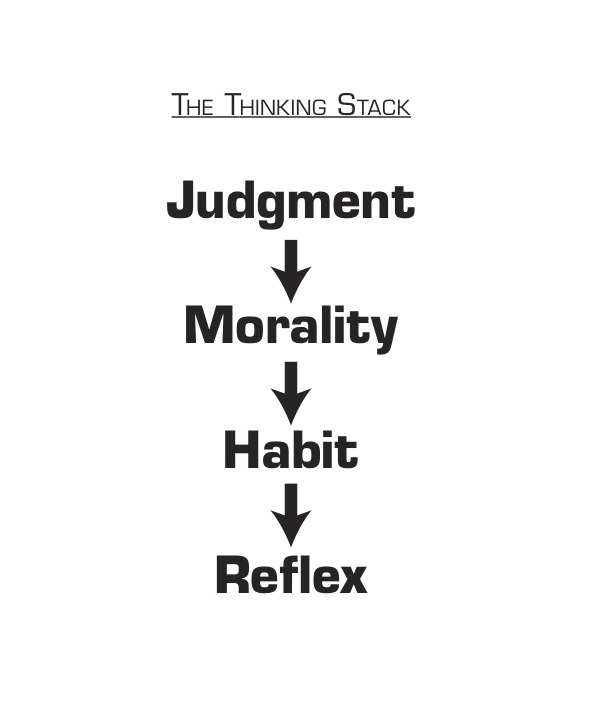 Judgment trains the rest of the thinking stack. If you are tying to change the way a person acts -- change their habits and morality -- you must reach and communicate with that person's Judgment level. When two people are arguing, and particularly if the argument is chronic, it is the Morality layers that are active in the two people, not the Judgment layers, and if that's the case, then the talking both are doing will accomplish little. It is only when the Judgment layer gets involved that retraining the other layers is likely to happen. This is the reasoning behind the truism, "You can't 'win' an argument." The conversation between Judgment and the lower layers is not one way. The lower layers can feedback to Judgment. The tools they use are feelings of well-being and discomfort. If the layers want to feedback discomfort, the Judgment layer feels pangs of guilt and anxiety in the case of the Morality layer, or it feels that things aren't working right when Habit and Reflex layers are unhappy. (I swing at the ball, but I keep missing). The Judgment layer does not make choices in a vacuum. First, it is very responsive to what is happening around it, Judgment takes in sensory perceptions all the time. But sensory perception is only one "Judgment advisor". Two others are Instinct and Wisdom. Wisdom is memory, plus reflecting on those memories (in computer terms: cross linking the memories in search of useable patterns). Wisdom feels a lot like Morality, but Wisdom is an advisor to Judgment, while Morality is an action taker. If the body hears someone say, "I'm voting Republican this year..." Morality is the part of the brain that starts to line up the response to that statement, and Wisdom helps Judgment decide whether or not to turn Morality lose and let it respond. Instinct is a "suggestion" or compulsion that comes to Judgment essentially "out of nowhere." It comes from inside the brain, but it is not the result of previous experience. It is not Wisdom because it is not based on prior experience. Instincts are time- and environment-driven. For instance, in a young teenage boy, the "suggestion" that a particular girl now looks very attractive is an example of an unfolding instinct. A year earlier, the brain had not made that suggestion, but when the brain/body combination decided the time was right to get interested in girls, the suggestion that women are pretty, and worth knowing more about, comes up. Instincts unfold all through life, they don't stop unfolding at puberty. Instincts feel warm, fuzzy, inevitable and permanent, or scarey and permanent, but in fact they are controllable and extinctable. The best description I have of an instinct is a slight modification of Barry Goldwater's Presidential campaign slogan in the 1960's, "In your heart, you know it's right." When dealing with the real world an instinct may be right, or it may be wrong, but in your heart, it always feels right, very right. My second year at MIT I attended a Black Studies class. This was the early seventies, and this was the first year Black Studies was offered at MIT. I took it because I was curious, and looking for an easy class. While attending the second day of class, I got this feeling that I didn't belong there. As the class went on, this feeling grew and grew, and I was getting scared. By the end of class period, wild horses couldn't have kept me from reaching that classroom door. While I was experiencing this panic at the emotional level, at the Judgment level my "jaw was dropping." How could I be feeling this way? I was raised in a household that supported integration; I attended a school that supported racial equality; and before coming to MIT I had spent three years working and living with black people in the Army. Where was this terror of being in a room with six "Tech Tools" who happened to be black coming from? MIT students may not be masters of social graces, but that doesn't make them threatening, and nothing was said to me in this time frame was the least bit threatening. I figured out that what I was experiencing was a sudden onset of Racist Panic. What I was feeling was an unfolding Instinct. My brain's Instinct layer, at age 24, had decided that it was now time to become sensitive to people of different races, and to let my Judgment layer know in no uncertain terms that these people were, "strangers, and not to be trusted." For the next few days my Instinct argued hard with my Wisdom. My instinct talked at the emotional level, and told me to be scared of what would happen if I went back in that classroom. My Wisdom told me at the intellectual level that what Instinct was saying was all horsepucky, and I had every reason to go back. I went back. That next class session I was very uneasy, but I stuck with my Wisdom's advice, and after that Instinct steadily relented. By the fourth class session I remembered my panic, but I was no longer troubled by it. There are two morals to this story: One is that instinct acts as a powerful suggestor to the Judgment level, but it can be overruled. Once Instinct has made it's suggestion it will fade away, unless it is reinforced by real world actions that support it. The second is that racism is a late unfolding instinct. The fact that children can function comfortably in mixed groups is no strong indicator of how those children will act as adults because the racism instinct won't hit them strongly until their middle twenties. Sometimes Wisdom and Instinct agree. One day when I was first switching from playing softball to hardball in middle school, the pitcher threw a ball straight at my head. I gave it no second thought; I ducked ferociously! As the ball passed me and was caught, the coach/umpire announced, "STRIKE." I looked at him in total amazement: how could a ball headed straight for my head be called a strike? "He threw a curve ball at you." said the coach with a smile on his face. My Instinct said, "This is really scarey!" My Wisdom said, "Are you sure you want to be playing a game where it's legal and accepted that another player is going to be throwing a damaging object at your head as hard and fast as he can, and that you are going to have to have faith it's really going to go some other direction?" My Judgment listened to both and said, "That's easy: No!" and that was the end of my hardball baseball ambitions. Too much Judgment thinking: "choking"
The Judgment Layer trains the other layers, and as Trainer, it has the power to intervene. For instance, there are several Moralities, Habits and Reflexes that tell your body not to walk on a bed of hot coals. But, if your Judgment layer decides your body should walk on hot coals, it will make the attempt. Likewise, as you are learning a sport, Judgment layer starts the learning process by telling the other layers exactly what to do. Ideally, when the other layers figure out, Judgment gets out of the loop. However real learning is an iterative process -- individual steps must be learned, unlearned and adapted as the whole system of playing the sport starts to integrate, so Judgment slips in and out of the direct control mode frequently. Lets assume you're playing, you're learning, and you're doing OK... Then comes the "big moment", and whoops.... you flub it up! You "choked". What happened? What may have happened was that at that stress moment your Judgment layer lost it's confidence in the other layers, and intervened directly to say how your body should move. The Judgment Layer is slow and clumsy compared to lower layers (after they are well trained) so your body moved clumsily instead of smoothly. The Moral: Part of learning to play a sport is training the Judgment layer not to intervene in times of perceived crisis. Too little Morality Thinking: "Panic"
Like Choking, Panic is another special case in the way the body thinks. First, lets talk about the difference between Sports Thinking and Panic Thinking. There are times when your body must think fast, and it knows what's going on. An example of this playing sports as mentioned above, and this is Sports Thinking. When playing a sport, the Judgment level stays fairly active -- it is observing and planning. The fast thinking happens because Judgment is letting Morality, Habit and Reflex handle the body's actions. There are other times when your body must think fast, but it doesn't know what's going on -- it hasn't practiced. Such a time is an emergency, such as being in a building that is on fire. In such times the body reacts to the demand for an emergency speed-up in thinking by panicking. Panic Thinking kicks in when the Judgment layer perceives that the body is in a situation that is both novel and dangerous. If the situation is familiar and dangerous, such as parachuting the tenth time, the body uses Sport Thinking. Because the situation is novel, Judgment has to handle it, no other thinking layer handles novelty. But normal Judgment thinking is slow -- not what is needed in an emergency. When a panic happens Judgment partly shuts itself down to speed up it's reaction time. This shutting down is called "becoming single-minded" or "focusing". When Judgment is in this panic mode, it will pay attention to only perceptions that are relevant to solving the single problem it has decided is the critical one to solve. It is for this reason that people do "crazy things" when they are in stressful, panicky situations -- the Judgment layer is not fully functional, so it's not seeing the full picture. This is also why a little preparation for an emergency can go a long way towards reducing crazy actions. Thinking about what to do in the event of a disaster is Judgment's way of training Morality. The more Judgment can hand off to Morality, the more sport-like the situation becomes and the less Judgment has to shut down. Chuck Yeager, the famous test pilot, talks in his autobiography about how much time he spent personally inspecting the workings of the aircraft he was going to fly, and reading the manuals -- particularly the "what can go wrong" and "what to do in an emergency" sections. This knowledge was training his Morality layer. When things did go wrong, his Judgment stayed active as the diagnoser of the problem, and didn't have to focus down to solve the problem quickly -- Morality was ready to order the quick actions needed. Panic reaction can happen because of acute physical threat -- such as the building fire I mentioned earlier. In such a case the panic is short-lived and recovery from the panic begins quickly once the threat passes. Panic can also be caused by longer-lived threats to the body's well being, and when the threat is long-lived, the panic will be long-lived as well. When I was sent to Vietnam as a soldier during the Vietnam War I knew I was being sent to a hazardous place, and when I got there I found the experience was novel. I didn't realize it at the time, but for the year I was over there, I was living in a long-term, low-key panic: my Judgment layer was partly shut down and highly focused. My single-minded mission: survive the year in Vietnam and come home safely. It wasn't until I returned to the States, and had many months to unwind, that I realized how scared (panicked) I'd been while I was over there. By the end of my year in Vietnam, the panic I was experiencing had become habitual, so it took many months to change the habit (to unwind), and then some more time to reflect on what I had experienced there. The moral of this is that there are times when full Judgment thinking is not what a body is using to make decisions. If the body is in a panic, then the range of options being considered by the Judgment layer will be constrained by the "focusing" and "single-minded" reflex of the Judgment layer in panic. A whole community can get into a panic. It happens when the community is stressed by a common problem, but one that tried-and-true solutions aren't solving. (Which is another way of saying it becomes a novel problem.) When the crisis becomes long term and novel, people's fears start to feed off of one another, and community Judgment starts to focus down. One example of a huge community panic was America and Europe experiencing the Great Depression. There are lots of crazy ideas put forward in society all the time, but more of these crazy ideas were given serious consideration during the Depression Years than during times before and after. A more current example of huge community panic is America dealing with the 9-11 Disaster. Rumsfeld's "prism" is an example Panic Thinking. Reality had not changed, but Leadership's perception of reality had changed dramatically. The reality is that before 9-11 it was just as possible to fly jets into skyscrapers as it was after 9-11. The 9-11 Disaster did not change terrorist capabilities, or the US's ability to deal with terrorist threats. 9-11 dramatically changed perception of both these abilities. Not only did it change perception, it changed the Leadership's way of thinking. Leadership became "focused" on the 9-11 issue -- terrorism and security -- whereas before 9-11 it had been addressing many other things as well, such as the economy, health care and the Enron Scandal. It is the panic thinking process that made the Leadership decide that a War on Terrorism was a good goal for our nation to aspire to, (as versus, dealing with many domestic economic problems) and it is panic-induced "single-mindedness" that has produced all the wild and crazy counter-terrorist measures American society has experienced since 9-11. It was panic thinking that produced the willingness of Leadership to take as "fact" what in normal times would be discounted as hearsay rumors. It was the single-mindedness effect of panic thinking which allowed American Leadership to believe that Saddam had huge and growing WMD capabilities, and that quick action was necessary. The single-mindedness of Bush and his advisors let them think they were doing the right thing when they spent hours and hours of their time whipping up support for intervening in Iraq, and when they were stepping on a lot of toes in the process. In summary, Panic thinking is the Judgment layer's way of imitating the Morality layer's speed. The body uses it in situations that are both novel and threatening. It is an expedient, and it doesn't work nearly as well as letting Judgment do what it does best -- think and analyze -- while letting Morality do what it does best -- implement Judgment layer decisions speedily. Panic thinking was developed by the body to use in those times when quick action in a novel situation is a lifesaver. But it seems to have found wider application than that in our modern lifestyles. The human body has developed a layered approach to thinking. It has done so to let the body have the best of both worlds: lots of thinking power and quick action. The Judgment layer perceives the world, makes choices and initiates actions. It's directions are passed down to the lower layers which take care of implementation. Judgment layer also trains the lower layers. When the body is learning, Judgment layer directs actions in detail until the other layers understand what they are supposed to be doing. While the body is learning, it's actions are slow and clumsy because the Judgment layer is not particularly quick. Morality layer handles "thinking issues" once Judgment layer has "made up it's mind" on those issues. Habit layer handles "physical issues" and those things that Judgment layer wants to give no thought to. Reflex layer is called by Habit Layer to handle the nitty gritty of getting actions accomplished. Judgment Layer is helped in its decision-making by Wisdom and Instinct. Wisdom is the body's memories of previous experiences crosslinked in useful ways, and Instinct is those ideas that come to the body "out of the blue" as the body ages and experiences certain events. Morality and Habit also feedback to Judgment on how well Judgment's decisions are working out. Finally, we have a different way of thinking when a situation is both hazardous and novel. That way of thinking is panic thinking. In panic thinking the Judgment layer partly shuts down so that it can make choices faster, but when it is in panic thought mode, Judgment doesn't perceive well, so important facts and connections are completely missed. And that's it. This is Part One of Roger's Model of how the body and brain handle thinking. Part Two covers the Brain's Archive and subconscious processing functions.